Vision testing equipment ranges from simple tools like the “Big E” eye chart (Snellen Chart) and a hand-held penlight and eye cover, to more complex devices that swap lenses in front of your eyes or use special lamps to view the eyes' structures. A comprehensive eye exam includes vision testing, and vision testing equipment that is common to almost all eye exams, but is often tailored to your age, your specific need, or your individual symptoms. 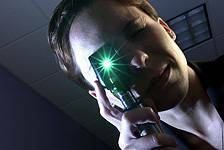 The following are some common tests you may be given during a routine eye exam. Retina scopes are used in eye exam procedures to accurately determine your prescription.